The third race of the cross country league season saw the women’s and men’s teams in different locations, with the Men in the Birmingham & District Cross Country League Division 2 hosted by Spa Striders at Burton Dassett Hills Country Park, while the Women’s Midlands Cross Country League Division 2 race was held at Churchfields Farm, hosted by Droitwich AC. 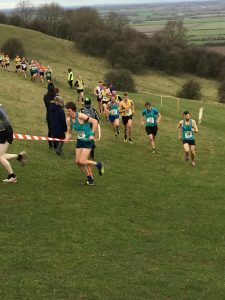 Both teams enjoyed undulating, some might even say “hilly” courses in good, if a little windy, conditions for Saturday’s races. The Men’s team went into the second half of their season at the top of the table with a healthy lead over their nearest rivals, and continued to pressure the other teams in contention; our ‘A’ team finishing just 4 points behind Knowle & Dorridge to come second in the race, whilst extending their lead to 84 points going into the fourth and final race of the season. Henry Brocklehurst was first home for Team Teal, continuing his streak of podium finishes in 3rd place, with Paul Thompson (8th) also in the top 10. The remaining scorers were Harry Thorpe (11th), Kevin Morris (21st), Mat Pollard (22nd) and Rich Bayliss (28th). The ‘B’ team also demonstrated their strength finishing in 2nd place on the day, ahead of their nearest rivals in the ‘B’ team table by 40 points. The whole squad numbered a fantastic 26 on the day with thanks to their supporters and especially to Karen Hall for the photos. 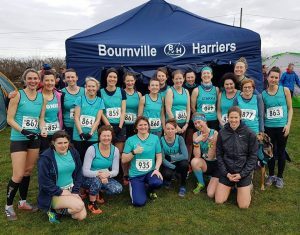 The Women’s Team held onto their 4th place narrowing the gap on the top 3 (and promotion) places in their race in Droitwich. Nic Sykes lead the team with another comfortable victory, with Jess Bond (34th), Monica Baptista (37th) and Lorna Al-Ani (38th) as the remaining scorers in the main race. Along with Monica (13th) and Lorna (14th); Alison Price (19th) and Laura Gale (24th) helped the team to third in the Masters race. 23 women turned out for the club on the day, and were well supported by friends and family, including Dave Ellis who stepped into the official volunteering role, took the team photo and with the help of Robert McManus and others assisted with the fantastic new team tent. 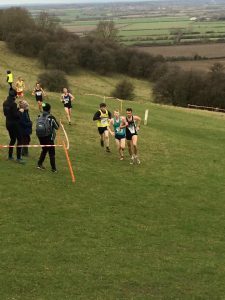 The next XC action is the Midland Counties Championships which takes place on 26th January at Newbold Comyn, Leamington and of course the final League races of the season are on 9th February when the men are hosted by Trentham AC at Park Hall Country Park, Stoke-on-Trent whilst the women are hosted by rivals for promotion Gloucester AC at Cattle Country Adventure Farm Park, Berkeley nr. Gloucester. The Team Managers, Rhian and James would love to have the best attendance possible for the final league races. The Women’s team would particularly appreciate any supporters who are able to join us on the day, especially given the home advantage for Gloucester.